The first trailer has arrived for Universal Pictures' Steve Jobs biopic, which is slated to hit theaters nationwide on October 9. Michael Fassbender leads an all-star cast as the title character and Apple co-founder in this biopic, which could certainly be an early Oscar contender when it debuts this fall. We have a long way to go until Oscar season, but this biopic could surely be one of the front runners for Best Picture. Set backstage at three iconic product launches and ending in 1998 with the unveiling of the iMac, Steve Jobs takes us behind the scenes of the digital revolution to paint an intimate portrait of the brilliant man at its epicenter. Steve Jobs is directed by Academy Award winner Danny Boyle and written by Academy Award winner Aaron Sorkin, working from Walter Isaacson's best-selling biography of the Apple founder. The producers are Mark Gordon, Guymon Casady of Film 360, Scott Rudin and Academy Award winner Christian Colson. 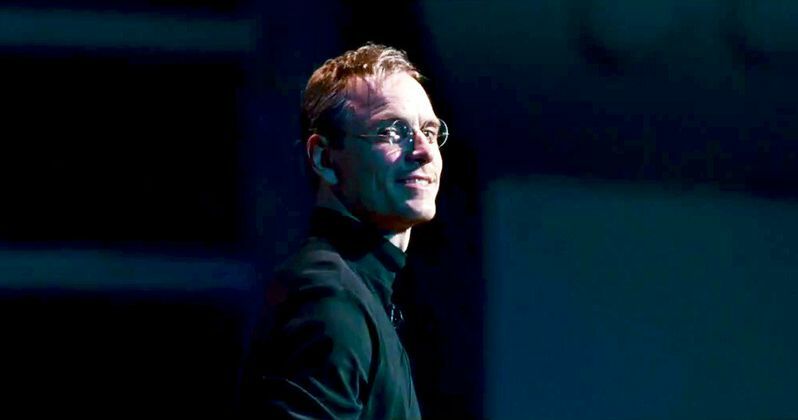 Michael Fassbender plays Steve Jobs, the pioneering founder of Apple, with Academy Award-winning actress Kate Winslet starring as Joanna Hoffman, former marketing chief of Macintosh. Steve Wozniak, who co-founded Apple, is played by Seth Rogen, and Jeff Daniels stars as former Apple CEO John Sculley. The film also stars Katherine Waterston as Chrisann Brennan, Jobs' ex-girlfriend, and Michael Stuhlbarg as Andy Hertzfeld, one of the original members of the Apple Macintosh development team. Check out the first trailer below, and stay tuned for more on Steve Jobs, in theaters October 9.